Nurofen Plus Tablets are for the short term treatment of acute moderate pain when other painkillers have not worked. Do not take less than four hours after taking other painkillers. These dual action tablets work both at the site of pain and also reduce the body's response to pain signals. 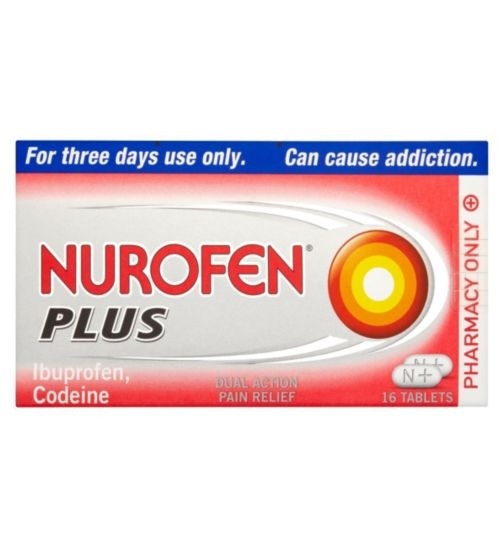 It's formulation combines Ibuprofen 200mg with the additional power of Codeine 12.8mg which is the maximum dose allowed without a prescription. These tablets are for the effective relief from migraine, headache, cramping period pain, dental pain, back pain, neuralgia, rheumatic pain and muscular pain. Not suitable for children under 12 years. Do not take if you have stomach ulcer or breathing difficulties. For 3 days use only. Can be addictive. Codeine & Dihydrocodeine Containing Painkillers; These painkillers are licensed for short term treatment of acute, moderate pain which is not relieved by paracetamol, ibuprofen or aspirin alone. This medicine contains Codeine or Dihydrocodeine that can cause addiction if you take it continuously for more than 3 days. If you take this medicine for headaches for more than 3 days it can make them worse and cause chronic daily headache. If you need to take this medicine for longer than 3 days you should consult your doctor. Always read the Patient Information Leaflet before taking any medicine. This medicine should not be given to children under 12 years. Paracetamol is an ingredient included in many cold preparations and branded pain killers. Always read the ingredient list of any medication you use - including prescription medication, in case it duplicates your dose; accidental paracetamol poisoning is increasingly common and totally avoidable if used responsibly. Do not take more than two doses of paracetamol of any type at any one time (2 x 500mg) or more than 8 tablets of any type in 24 hours. For Ibuprofen, always take with food and do not take more than two at any one time (2 x 200mg but just 1 x 400mg) or more than 1200mg in 24 hours. Please email/ring us if you have any questions about this medicine. Alternatively, you could speak to your family Doctor.